The Sheldon Jackson Museum’s February Artifact of the Month is a Yup’ik stone lamp (SJ-II-28). The lamp was collected by Sheldon Jackson from somewhere along the Kuskokwim River. Though simple in design and not as fancy as some of the other stone lamps in the collection, the February Artifact of the Month yields important information about traditional Yup’ik and Inupiaq stone lamps, their use in the home, and how they were made. Oil lamps were the primary source of light and often heat in Inupiaq and Yup’ik buildings and were used on a daily basis and during ceremonies. In some regions, oil lamps were used for cooking with pots suspended over the lamps; in others, pots were directly placed over wood fires. House lamps were also hung from posts in corners for light. Among the Yupiit, oil lamps were found only in qasgit, communal mens’ houses. Traditionally, in the Yup’ik qasgiq, two lamps were supported by posts placed in the ground and located on either side of the fire pit. During ceremonial dances, a third lamp would be located in a space in the middle of the room or suspended from string from the ceiling and moved with the beat of the drum. The most desirable fuel for stone lamps was seal oil but fish oil, caribou tallow, marmot fat, beluga oil, bear grease, and mountain sheep tallow were also used, depending upon availability. Because these oils were used for food consumption, this could make having sufficient oil of one kind for both fuel and food challenging. If there was ample fuel, there were sometimes many lamps used in a home with a lamp per each married woman living there. If supplies of fuel decreased sharply or if famine hit, the number of lamps was reduced. Most stone lamps were made by pecking a depression into a stone with roughly the desired shape. The stones used included sandstone, serpentine, and talc. Occasionally lamps were made out of pottery and rarely, wood. 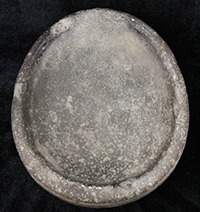 Their shape was often semi-lunar or oval, like the February Artifact of the Month. They ranged from around six inches to more than three feet in length and three inches to a foot wide. The smallest ones were carried by travelers while the largest were usually owned by coast dwellers who lived in houses. Some of the bigger lamps were divided into two or more sections. In some areas, lamps were placed on stands and a pan was put beneath it to catch any oil that might drip out. Lamps made out of clay were made with clay found in seams along the coast or on riverbanks at low tide and were made in the summer by women. Wicks were made out of dry moss collected by women in the summer. To make a wick, the dried moss would be crushed using fingers until it was the consistency of coarse tobacco. A piece was soaked in oil and ignited. As the wick material burned, it was replenished the length of the bowl. According to Yuungnaqpiallerput - The Way We Genuinely Live: Master Works of Yup’ik Science and Survival, lamps were jointly cared for by men and women with the men telling their wives oil or wicks were getting low and the wives then adding more wick or oil. The Sheldon Jackson Museum’s February Artifact of the Month will be on exhibit until February 28th. This museum is home to twenty-three stone and clay lamps, the majority of which are Inupiat. Visitors can see the Artifact of the Month, the museum’s other stone lamps, and many other Yup’ik artifacts Tuesday through Saturday between 10am and noon and 1pm and 4pm. General admission is $5, $4 for seniors, and free for those 18 and under or members of either the Friends of the Sheldon Jackson Museum or Friends of the Alaska State Museum. Most often, the cooking area was in the center of the main room, if in a four-post-center home and in an alcove off the entry tunnel, if in a semi-subterranean sod house.